Now there are lots of choices. Under House of Commons (in the middle), look down a bit and click on Webcasts. Then click on Month. For Tuesday, October 4, scroll down and click on FAAE Meeting No. 4, then View this Clip, then Floor Audio, to hear the Libya briefing I attended. Floor Audio contains both French and English, whatever language whoever was speaking chose to use. Many who speak switch back and forth frequently. Another useful choice, on the page after the Welcome page, is Parliamentary Business (at the top). Click, then click on House of Commons Committees, then, on the left, click on Committee List. Clicking on the name of any committee will bring up a list of some recent events (if any), in reverse chronological order. In the summer, I clicked on Subscribe, for one committee, then registered. Almost every day, I receive an automated email; most say nothing is scheduled for that committee, but some have been very helpful in alerting me to planned meetings. Also, on the first page with details for any committee, on the left, clicking on Membership will bring up a list of all members (below the calendar – scroll down). Clicking an M.P.’s name will provide links to her/his photo (M.P. Profile), and more. There’s a wealth of data on this huge site. Much is linked in several ways, making it easier to find. 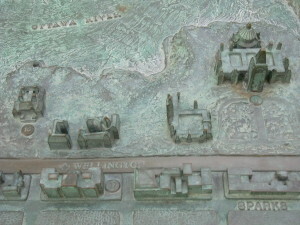 This little metal view of The Hill and environs stands on the north side of Wellington Street, east of Albert Street, a few streets west of Centre Block. 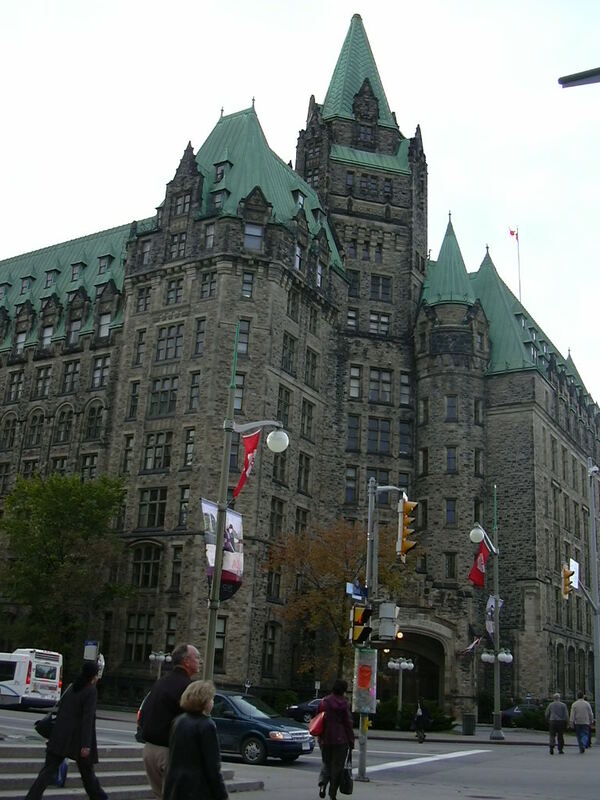 The Confederation Building, which houses Elizabeth May's office, where I'm based, is just west of West Block. 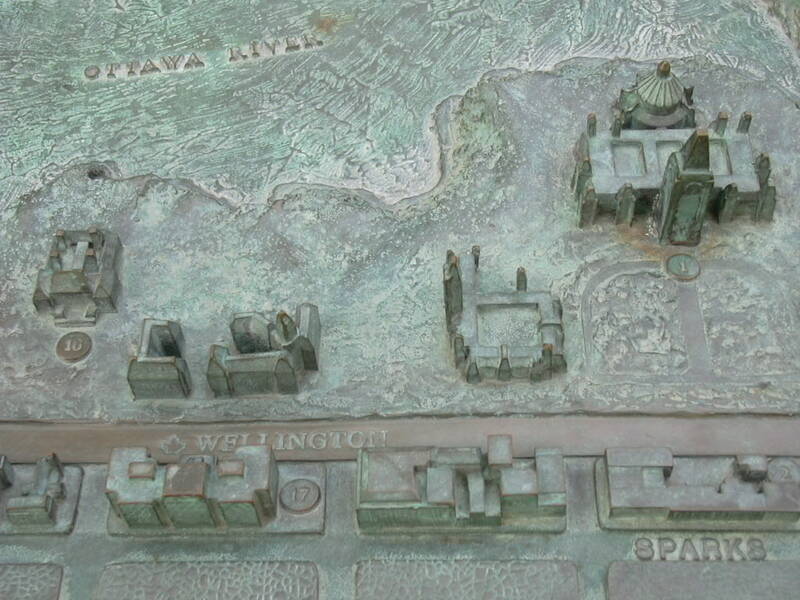 The closeup shows, starting on the right, Centre Block with the Peace Tower, then West Block, then the Confederation Building's three wings. Although she’s a Member of Parliament, Elizabeth can’t be a member of any House of Commons committees. Under current rules, only once there are a dozen Green M.P.s, will Greens be able to sit on committees. That means Elizabeth can be in the House all the time, whenever it’s in session. She quickly became very active there. Details of some of what she’s said and done in the House are on the Green Party of Canada website, greenparty.ca. Learning about committee business is one task for her staff and volunteers. We’ve all been doing our best to attend as many committee meetings as possible. The Confederation Building is on the northwest corner of Wellington and Bank Streets. 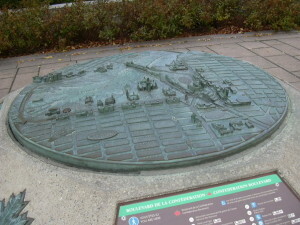 La Promenade is one block south and one block east, at the corner of Sparks and O’Connor Streets. Its location can be seen in the closeup above. To be admitted to La Promenade, I show my i.d. card to the security staff in the large glass enclosure just past the entry. At least three people are usually working there, and one activates the control that opens the clear, shoulder-height doors so I can walk through. Eschewing the elevator, I climb the wide central staircase, to the second or third floor. On the wall outside each of the three large committee rooms I’ve been in is a monitor screen, showing some details about what’s scheduled. So far, I’ve not had complete success in interpreting what I’ve read. The screen has not shown “in camera” when a meeting turned out to be so, and the three of us who’d come from Elizabeth’s office had to leave. The screen has shown “in camera” when only part of the session was such, so I’ve been able to attend the public part. Or it’s shown a meeting later in the day, rather than the one I’ve come for. More experience will help, I think. Inside the doors is a hallway, with places to sit. The committee room is beyond more doors. The committee chair, vice-chairs and the committee clerk sit across the front of the room, facing the others present. On their right sit the government M.P.s who are committee members; M.P.s not in the governing party sit on their left. These three groups form three sides of a rectangle. On the fourth side, facing the chair, are the visiting speakers, often government staff members. On the table in front of each person in the rectangle is a microphone. Earphones within reach of everyone in the room amplify what’s said, but that’s not really necessary. Simultaneous translation is provided via the sound system. And those responsible for producing the report of the committee’s proceedings also rely on it; once, when it wasn’t working and all of us present could nonetheless hear just fine, the meeting had to pause for a few minutes, so the system could be fixed. There are two rows of chairs for staff, one behind each row of M.P.s. Behind the witnesses are two tables reserved for the media. Once, there were more reporters than chairs, and one person at the front was running a camera, facing the witnesses. Other times, no media have attended. Behind the media tables are several rows of chairs for the public. So far, at least a few of those chairs have been occupied, but there’s always been plenty of room for more visitors. Topic examples: at a Natural Resources committee meeting, resource development in Canada’s north was discussed. And one Foreign Affairs committee meeting was a briefing update on Libya. Witnesses make opening statements, and then respond to questions M.P.s ask. All who talk are focused and respectful – no Question Period-style antics. Every member has the chance to speak, within rigid time constraints. The chair is responsible for keeping the meeting on track. 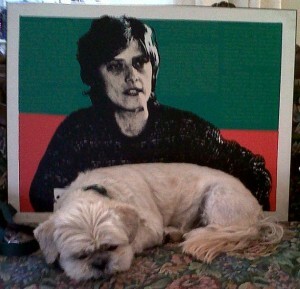 Occasionally, an M.P. takes too long. When this has happened, chairs I’ve heard so far have been polite and gentle while succeeding in being extremely firm – they are experienced politicians. So far, I’ve taken notes by hand, on my lap, although outlets for computers are in the floor. There’s always water in pitchers, with glasses – nice not to see bottled water. Once, there were a couple of kinds of juice. And once, coffee, tea, a variety of cut-up fruit, and big, chewy cookies were available – yum. Please keep the comments coming; more blogposts soon. 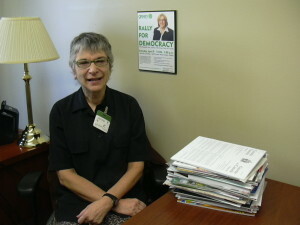 On September 15, I arrived in Ottawa, to be a volunteer for Canada’s first Green M.P., Elizabeth May. Since then, I’ve seen – and heard – Question Period, been asked to leave a committee meeting, tasted some of The Hill’s comestibles, struggled with connectivity, and experienced a lot more. Connectivity difficulties have delayed starting this blog. Smart ‘phones are used non-stop on The Hill, and M.P.s have Blackberries, so as soon as I arrived in Ottawa, I got one. And netbook, lighter in weight than a full-strength notebook, was my choice. I thought emailing and blogging would be easy. I was wrong. In general, non-Hill computers can’t be online in Parliament buildings. My office desk has a cable on it, waiting for its Hill-system computer to be delivered – soon, we think. And so far, I’ve not been successful in connecting at home in Ottawa, and I’m not sure yet whether this will be an easy problem to solve or a hard one. My first trip back to Toronto, my netbook connected to the VIA system, but not this time. Elizabeth’s office already has three computers online. Now that I’ve got my security pass, I can come in early and stay late, so I’m able to use one of those. Security passes are credit-card-sized plastic, on lanyards. A letter from Elizabeth’s office to the security office gets the process started. A security check follows – I don’t know exactly what that entails. My pass admits me to any of the Parliament buildings. Before that, photo i.d. from me, and a telephone call up to the office by the building’s security staff let me, and my backpack, through the scanners, and resulted in a visitor’s pass good for one day at a time. I’m honoured to be staying in Elizabeth’s apartment, in a historic building half an hour’s walk from the office. As soon as I arrived, I met Spunky. 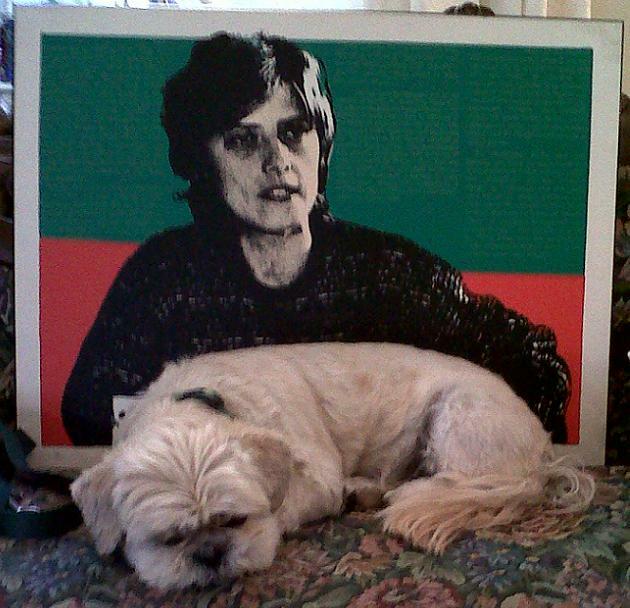 She’s a shih tzu, and has happily achieved the advanced age of twelve. For the first time in my life, I’m walking a dog. Dog people, I’ve learned, exchange the names of their charges when meeting on the street. But one lovely warm morning, at 3 a.m., when Spunky took me for a long brisk stroll, we had the whole block to ourselves. Please check here for upcoming blogposts: Question Period and committee meeting(s), as mentioned above; food on and around The Hill; my OC Transpo and walking adventures – I’ll try to include whatever I see and do in Ottawa. And I’ll look forward to comments.